Earlier in December, I had the opportunity to travel to Boston for the two-day SDL Web 8 System Administration Course in Wakefield, MA. It’s an excellent course, especially for those transitioning from Tridion 2013 to Web 8 and for people like myself who are traditionally weak in the area of sysadmin. I would highly recommend it. Our instructor, Freddy, with his authentic New York accent and no student left behind policy, took good care of us all and made sure we had everything we needed to work through the exercises on cloud servers provided by SDL. He made the course highly interactive and encouraged us to work together, dig deeper and help one another troubleshoot several issues that arose. 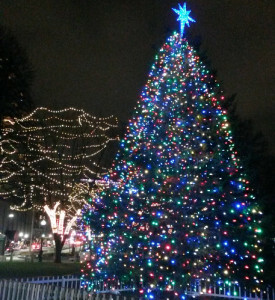 The annual 40-foot Christmas tree gifted to Boston from Halifax, as a thank you for help rebuilding after the disastrous Halifax Explosion of 1917. The course covered all key aspects of installation and set up for a basic Web 8 content management environment: architecture, databases, content delivery, Discovery Service, Topology Manager, Experience Manager and more. We also touched on some basic DXA concepts and used the Site Wizard to create a new site. While I had previously covered some of this on my own (see my blog post), it was a nice review which also included several new topics. One of more useful parts of the course, for me, was the discussion on Topology Manager – a new component of the CMS in Web 8 that can take some time to fully understand. By the end of the course, we were able to fully understand each and every element of Topology Manager, from the Content Manager all the way through to the Presentation Server. I would certainly recommend this course for anyone with Web 8 on their radar. Whether you are fairly new to Web 8 or a total noob, you will find the topics and exercises invaluable. We were also informed of several options for an upcoming three-day SDL Web 8 Developer Course, in Amsterdam and Wakefield, MA. The developer course is a more advanced course that dives deeper into DXA websites built with .NET MVC. A Java version of this course may also be available. I hope to be attending that and I hope to see you there! A big thanks to SDL! And with that, Merry Christmas to all, and to all a good site! This entry was posted in Tridion news by Damian Jewett. Bookmark the permalink.